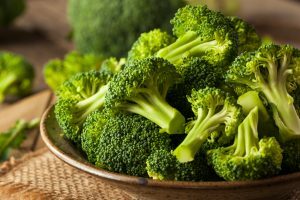 A new study, from the European Journal of Medicinal Chemistry, reports that synthesized chemicals that mimic those found occurring naturally in broccoli, cauliflower and other cruciferous vegetables, have the ability to inhibit melanoma. The synthesized chemicals, in fact, were able to inhibit the growth of melanoma cells by about 70% in an experiment on mice. My last blog showed that tomato powder also had the ability to cut the risk of melanoma by 50% in another mouse experiment, and other studies have also shown that fruits and vegetables have important anti-cancer effects. So when we talk about the reasons that melanoma has increased so rapidly, despite the best efforts by the sunscreen industry and the anti-sun movement, we know many reasons that are backed by science: Lack of regular sun exposure, alcohol consumption, milk consumption and lack of fresh fruits and vegetables in the typical modern nutrition program. Other investigations have studied the relationship between melanoma survival and fruit consumption. Melanoma patients who had their cancers removed—and who had a predicted death rate of 40% within 10 years—were assessed for consumption of fruit and red meat. Daily fruit consumption correlated to a reduced risk of death of 46%. Those who ate red meat at least once weekly showed an increased risk of death of 84%. Eat your vegetable and fruits, eschew the meat and most other animal products, obtain regular, non-burning sun exposure, forget the alcohol and milk products and enjoy many outdoor activitiesin natural surroundings. Many of these factors will be discussed in my forthcoming book, Embrace the Sun. Deepkamal N. Kareliaa, Ugir Hussain, Parvesh Singh, A.S. Prakasha Gowdad, Manoj K. Pandey. Srinivasa R, Ramisettia. Shantu Amin, Arun K. Sharma. Design, synthesis, and identification of a novel napthalamide-isoselenocyanate compound NISC-6 as a dual Topoisomerase-IIα and Akt pathway inhibitor, and evaluation of its anti-melanoma activity. European Journal of Medicinal Chemistry 135;28:282-295. Gould Rothberg BE, Bulloch KJ, Fine JA, Barnhill RL, Berwick M5. Red meat and fruit intake is prognostic among patients with localized cutaneous melanomas more than 1 mm thick. Cancer Epidemiol. 2014 Oct;38(5):599-607. More evidence that sunlight prevents breast cancer and other cancers—at all ages.